In an ideal world airplanes would be powered by renewable energy. We aren’t there yet. 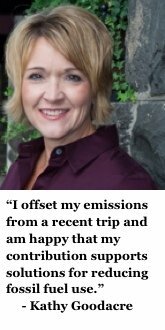 Until we are, we can offset our emissions from travel using a carbon calculator and then supporting carbon-reducing measures that are roughly equal to the carbon we emit. Use the below calculator to determine how many metric tons of carbon you will emit in your travels. Then multiply that number by 8 to get a rough estimate of the cost of that carbon. Donate this amount to the Center for Climate Protection to offset your trip (use the donate button to the right). Click here to donate once you have calculated your offset.